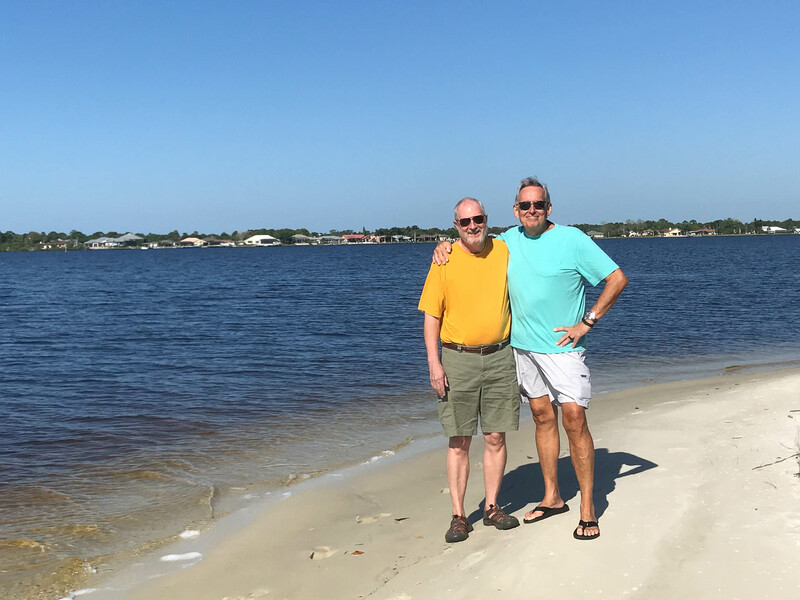 As we made our way from Tampa Bay area to the Keys, it was so nice to visit family and friends in the Nokomis and Port Charlotte areas. 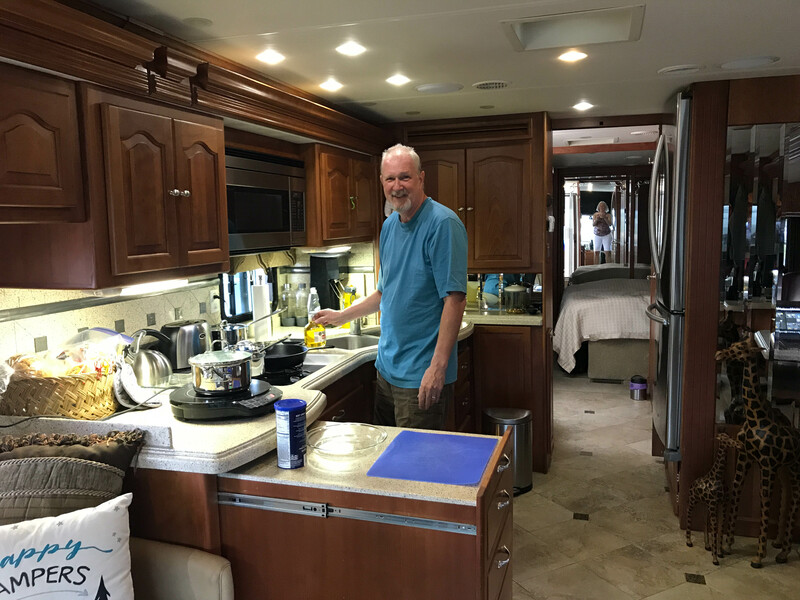 Private RV resorts were the best option for proximity and availability in these popular areas unless we reserved months in advance. We thought the snowbird season was ending but it looks like it will be another couple of weeks. Although we have stayed in large parks many times before, it’s particularly shocking to my system to stay in crowded areas after being in the wooded wonderlands of the county parks recently. 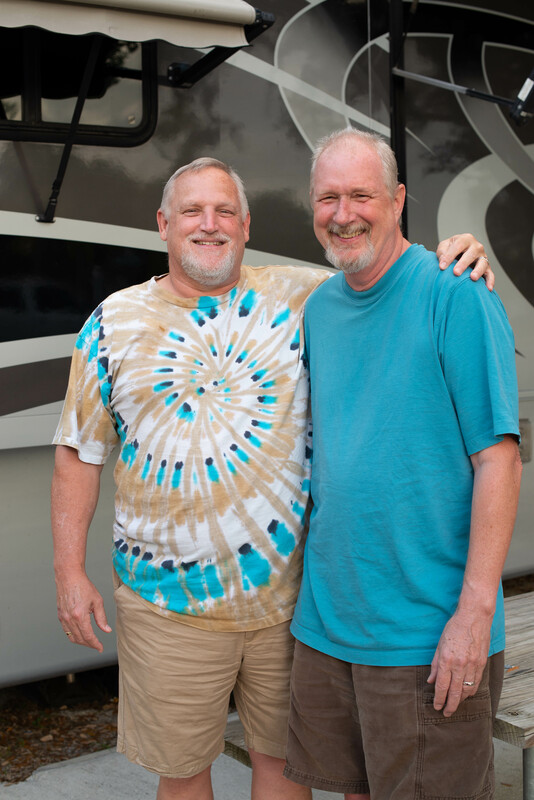 Riverside RV Resort is a huge, Thousand Trails Encore park with 500-plus sites. 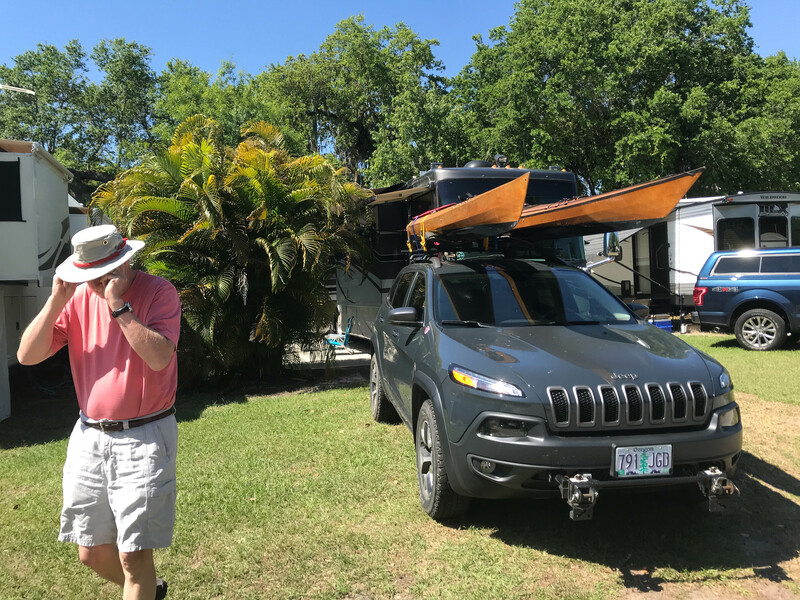 There were only a few sites open and ours was VERY narrow and backing into our site was made more challenging by the golf cart that was parked right on the line between sites. Despite the limited space, we lucked out that our paved patio was behind a nice bushy palm and our neighbor had no windows on our side. Our patio backed to a waterway obscured by vegetation but I could hear a few alligator grunts here and there. It was tight but ok for our 4-night stay from March 20th. We had a nice visit with Bruce’s 2nd cousins and family in the Nokomis area. 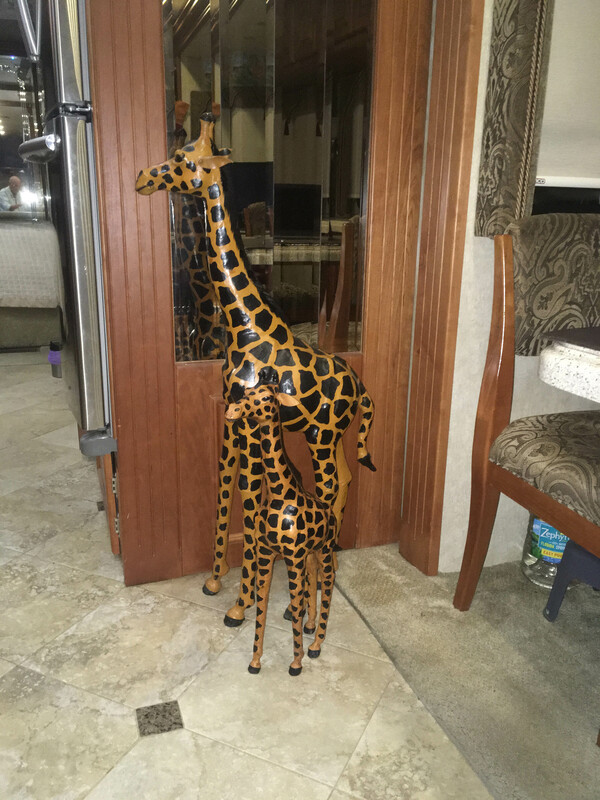 I’m not sure how it happened, but we came home from dinner hosted by Alan, with two LARGE leather and wood giraffe statues that match some smaller ones we had purchased in Tanzania years ago. It seems there is some downsizing of Uncle Werner’s travel mementos underway. Bruce has been trying to get me to downsize my rocks and shells which are so small compared to these 3 1/2 foot tall statues! They add a little unique personality to our house! It was a delight for Mark to come for a visit before we left, we don’t have many visitors! Right on the popular Peace River, the park has boat and kayak launches, fishing docks and lots of planned activities near the pool. 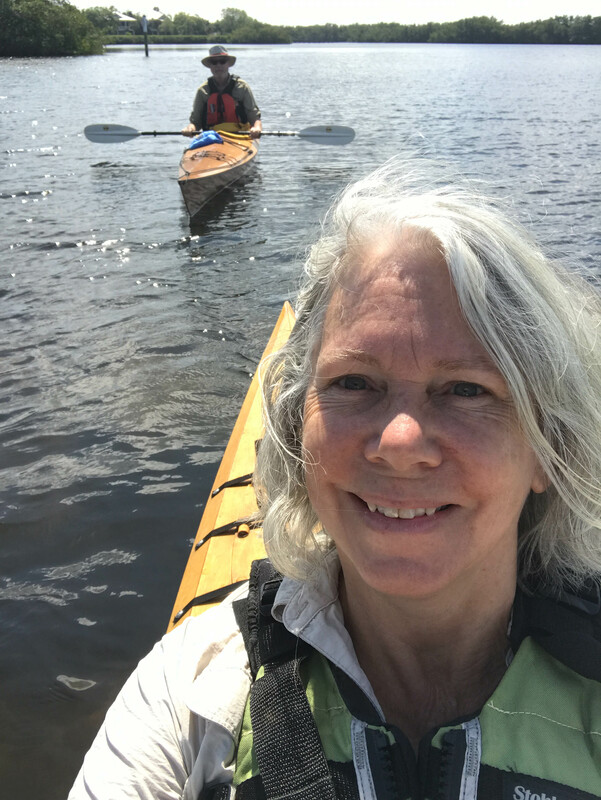 We could have stayed in the Arcadia area much longer, there is so much to do around there and we wanted to get the kayaks in the water but we had reservations closer to Bruce’s friend Rob in Port Charlotte. 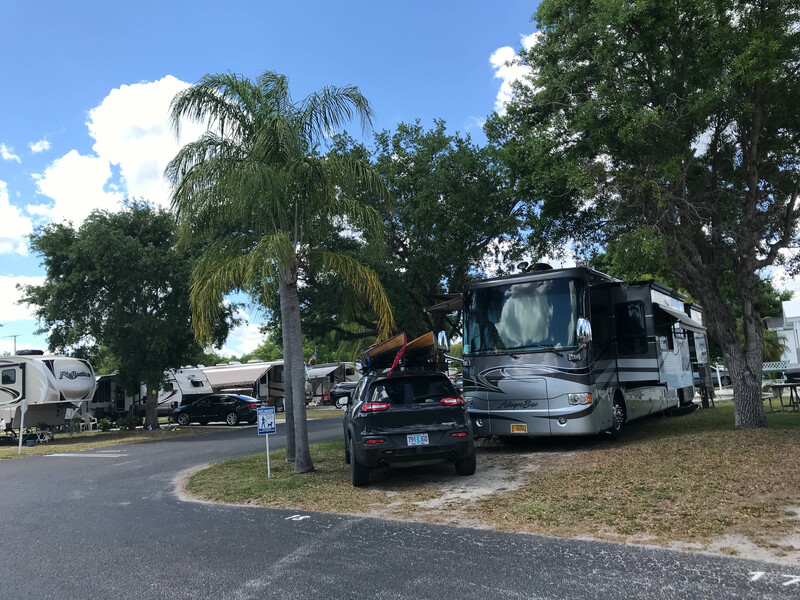 Our March 24th 8-night stay at another Encore Park, Harbor Lakes RV Resort in Port Charlotte, is literally right next door to Rob’s beautiful gated community on the Myakka River. This park has no river frontage and is also very large with over 500 sites primarily comprised of park models – think mini-mobile homes. The community is active with pickleball and shuffleboard courts, a pool and lots of activities. A parade of bicyclists, motor cyclists, dog walkers and people rushing to the pool or the courts made interesting people watching. The community of French Canadians is so large that the activities calendar is printed in both English and French and we heard a lot of French being spoken around the park. 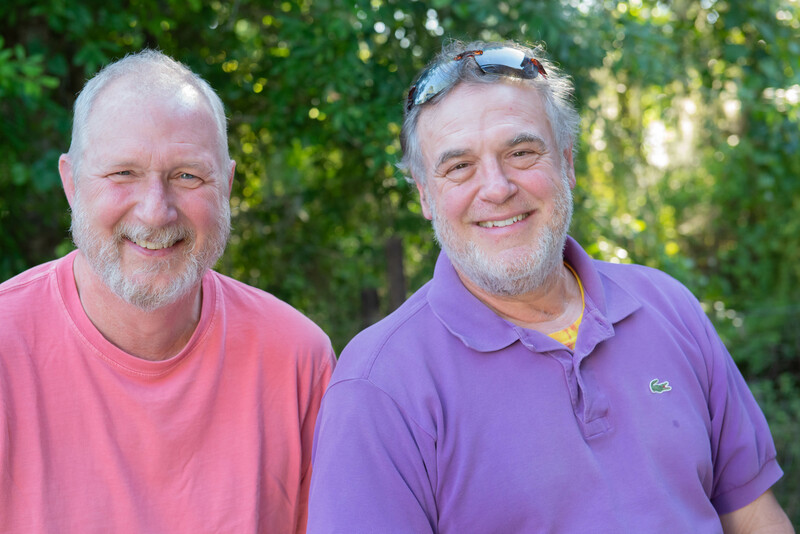 Bruce and Rob worked together some 25 years ago and catching up was nice. 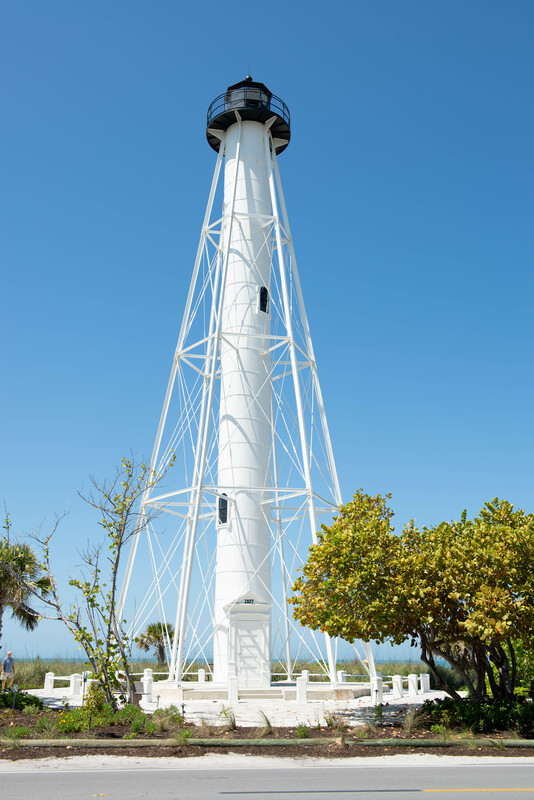 We enjoyed a grand tour including Gasparilla Island and Boca Grande as Rob pointed out his favorite kayaking spots and popular sights. 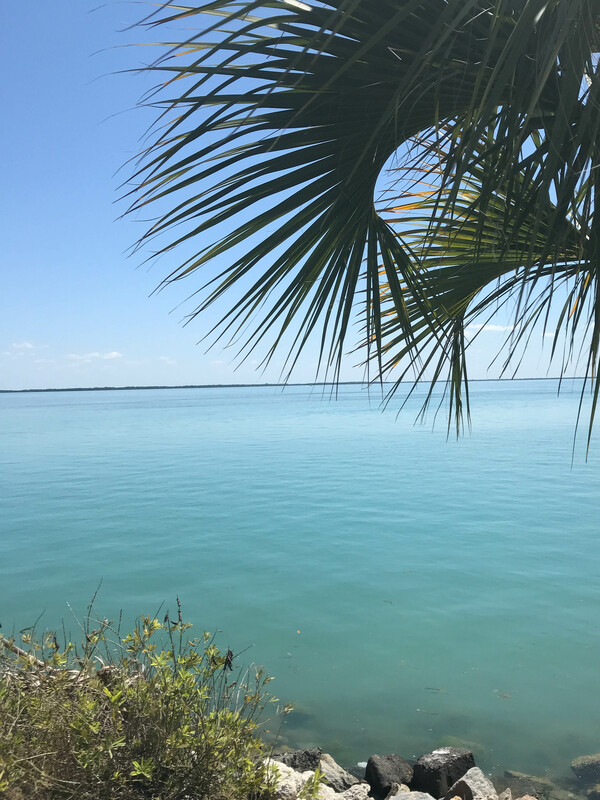 The views of clear turquoise water with mangrove trees and beautiful beaches were amazing. Now that Spring Break has arrived, the parking is impossible after 9am and forget getting into restaurants during regular lunch hours. 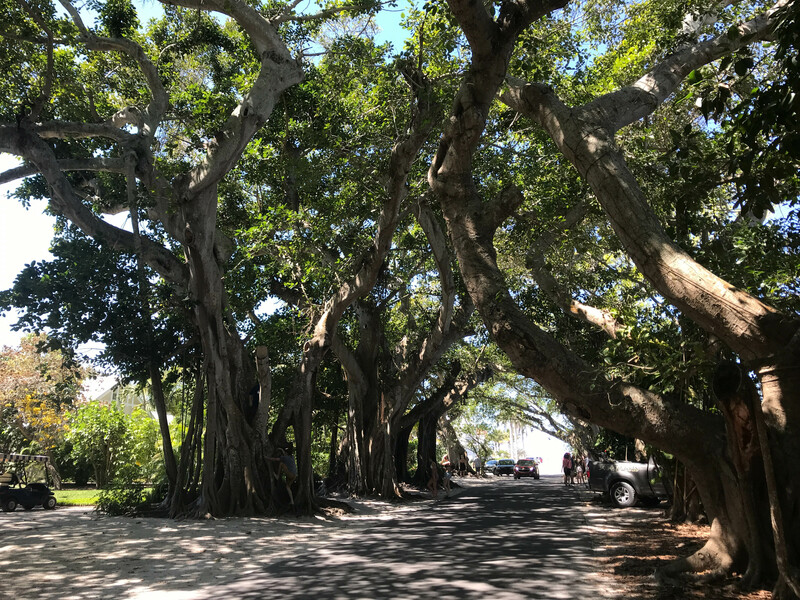 Golf carts are a favorite vehicle in Boca Grande with dedicated pathways which helped ease the traffic congestion. Some shops even had dedicated cart parking. 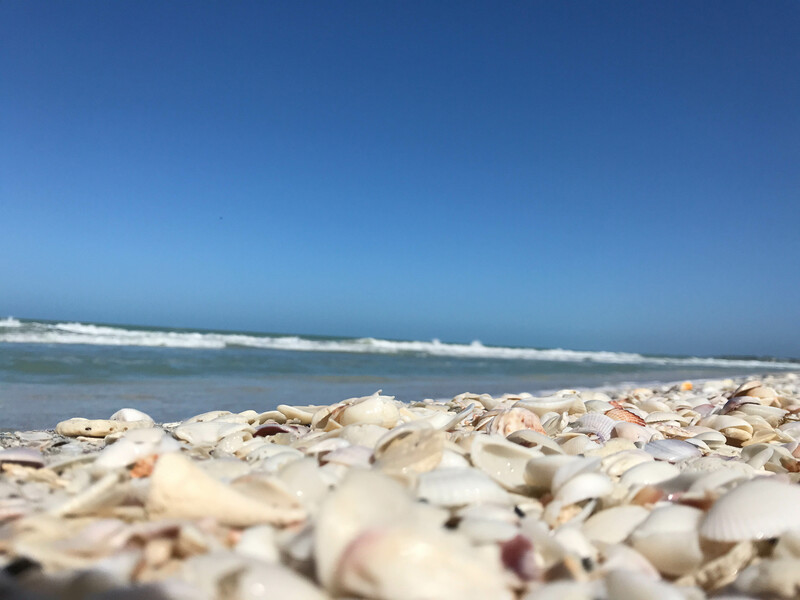 Rob’s stories about gators walking on the sidewalk in his community, dolphin sightings while kayaking, and turtle-nest patrol during the summer in Boca Grande were fascinating. A paddle in the shallow and tidal mangroves at Coral Creek in Placida was fun (once we got a parking spot). The Blue Heron paddling trail weaves around through the mangroves and each “island” looks the same as the others. I could get lost so easily in this watery jungle. Seeing the dolphin again after our tour with Rob the other day would have been a bonus. The highlight was watching osprey fishing above us, but no dolphin visited today. 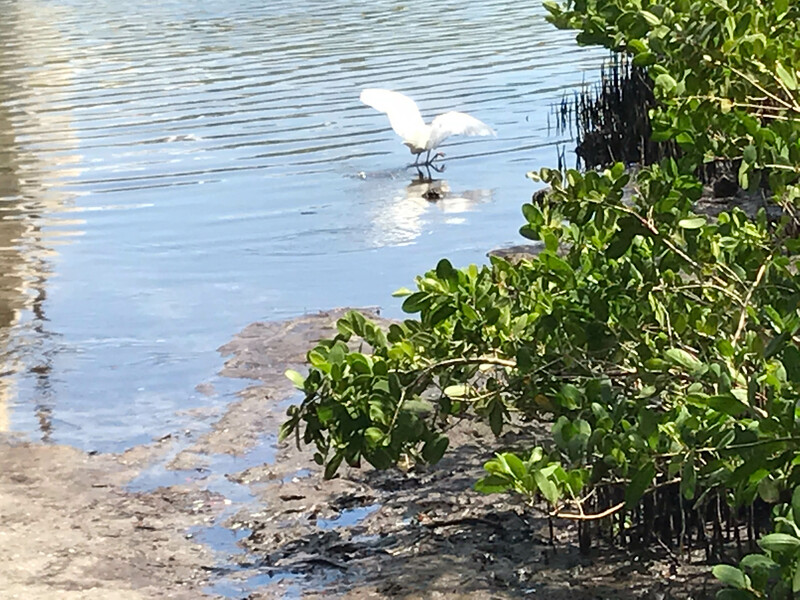 Thank goodness, Bruce was paying attention and led the way back through the mangroves to the launch site. 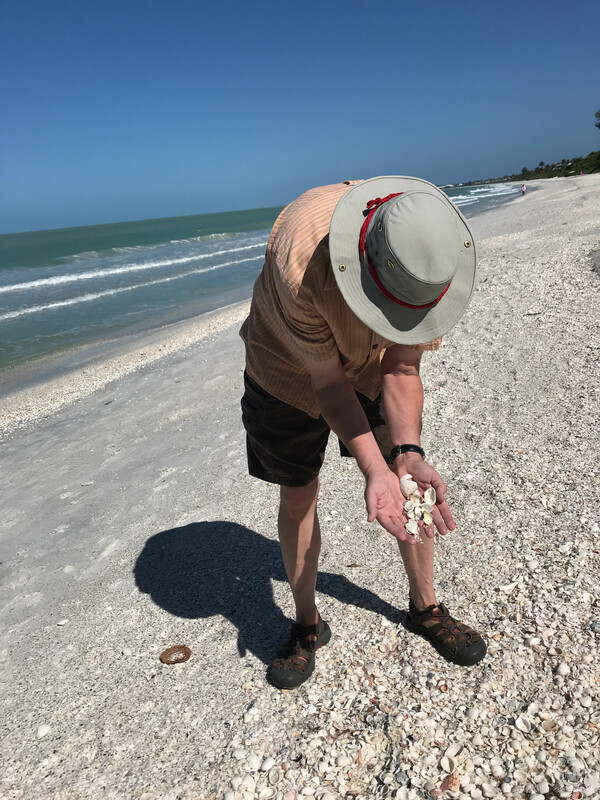 The beautifully curated shells, sharks teeth and seed pods that Rob and his wife have collected over the years set our priority for a day of beach combing. 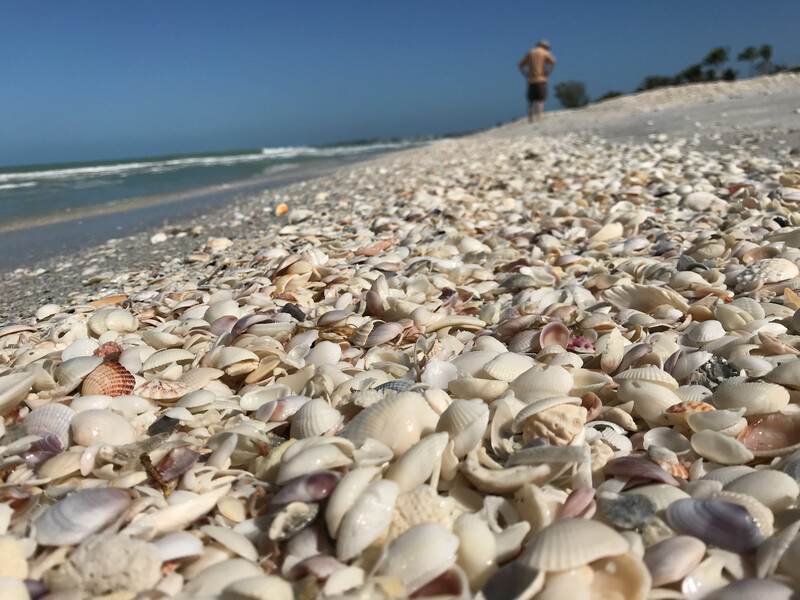 Just after 9am and the last parking spot near a beach on the North side of the island where the best shell beds are located was the beginning of an unbelievably nice walk in the shells! 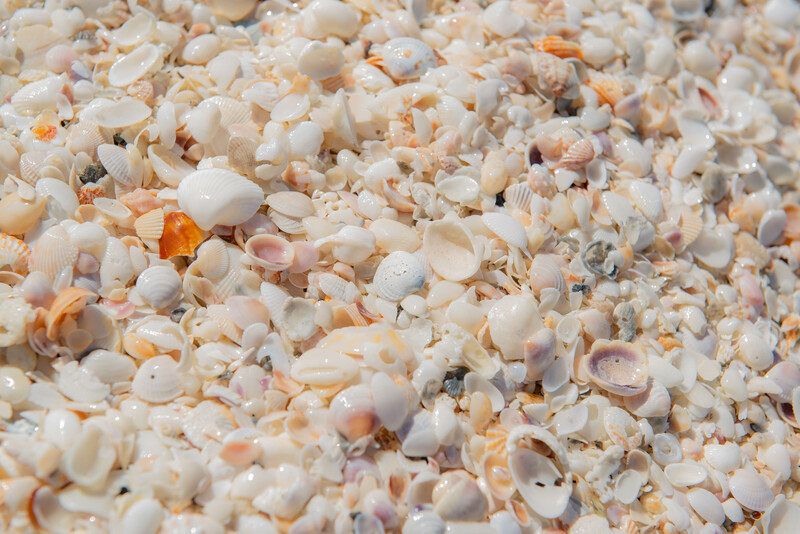 Bruce was picking up big handfuls of unbroken shells and shaking through them to find the best ones. It was so fun to see the shapes and colors of these beautiful gifts of nature! 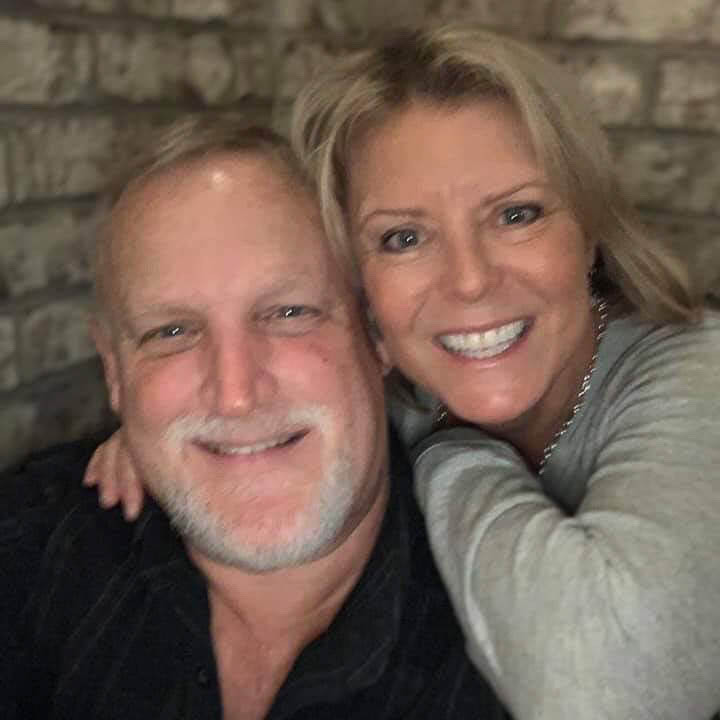 We enjoyed hosting dinner and catching up again with Bruce’s younger cousin, Alan and his girlfriend Carrie at our house. Alan hosted 10 family members last week at his house in Nokomis and it was hard to catch all the conversations. We enjoy visitors and seeing their reactions when they tour our large tiny home. Alan agreed that the giraffes he gave us look great in here! Way to downsize your house Alan!